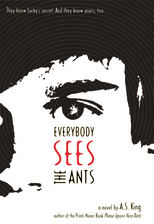 I am super-excited that I have the opportunity to participate in the EVERYBODY SEES THE ANTS blog tour! (You can see all of the other stops on the tour here.) First of all, I loved the book -- you can read my review here. And secondly (any maybe most importantly), I adore A.S. King ! I have been fortunate enough to spend some time with Amy at the book release party for her last novel PLEASE IGNORE VERA DIETZ -- wasn't that an amazing novel? 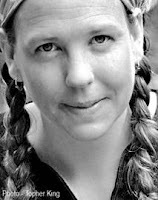 In addition, she has been a guest author at the past few Lititz Kid-Lit Festivals. Amy is not only a one-of-a-kind author, but also an extremely interesting person. And I think you'll get an idea of just how special she is with our interview -- enjoy! Booking Mama: I was blown away by EVERYBODY SEES THE ANTS! Really, truly, blown away -- you just keep getting better and better. In EVERYBODY SEES THE ANTS, you tell the story of Lucky Linderman, a fifteen year old boy who dreams about meeting his POW/MIA grandfather. You wrote the book in the voice of Lucky who happens to be a teenage boy, and I thought you nailed it. Since you are definitely not a teenage boy, did you have any concerns with writing from a boy's point-of-view? What challenges did you face as a writer in trying to capture Lucky's voice? A.S. King: Thank you! I’m so glad you enjoyed the book! You know me, Julie, so you know I’m dead serious when I say: I never thought about Lucky’s gender (or mine or how the two are different) before last week when someone mentioned it for the first time in an interview. It just didn’t occur to me. I’m not sure why—considering other parts of the book are about gender. I can only guess that the issues Lucky faced were more universal and that they transcended gender. At least in my mind, they did. While aspects of the book posed challenges, Lucky’s voice wasn’t one of them. He just came out naturally. And as we pruned and shaped, he got more and more real. I think the pruning helped. He was probably more talkative in the early drafts, which we trimmed because he was hiding emotionally and most people in that situation don’t have a lot to say. Booking Mama: I have read all three of your novels, THE DUST OF 100 DOGS, PLEASE IGNORE VERA DIETZ, and EVERYBODY SEES THE ANTS. Of course, I loved them all! One thing that they all have in common is that the stories are very unique and original -- unlike anything I've ever read. When I interviewed you last year, you mentioned that you were working on a first draft of EVERYBODY SEES THE ANTS and "But I have no idea what it's really about yet. I hope to sit down and really figure that out over the winter." I am curious about what the inspiration was for EVERYBODY SEES THE ANTS? And, at what point in your writing did you figure out what direction you wanted the story to take? A.S. King: You’re totally going to make me blush. I’m so lucky to have fans like you—who enjoy reading things that might not be what one expects. I’m a lover of weird books, myself, so that is a huge compliment to me. My books build themselves slowly. I learn about them as I go. Characters polish up and the plot irons out and then things start to solidify. It’s very like building a house. The first few drafts are structural and the final few are like finding the right lamp for the right room. Every book starts with a character for me. In this case, it was a character sketch that came out on one page one day back in 2008. This kid showed up and his father had lost his father in the Vietnam War and he was still missing and even though the father plastered POW/MIA logos all over everything, he wouldn’t talk about it. 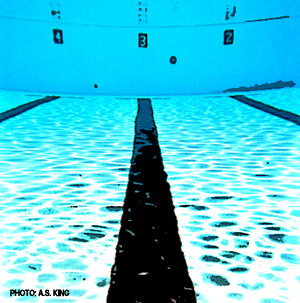 And his mother swam a lot of laps. When you write blindly (or by the seat of your pants…or sans outline) there come these moments where your brain makes you take a huge risk. One minute, you’re sitting at your desk writing a perfectly sane scene, and the next minute, your main character is getting the crud kicked out of him and is talking to ants. And then the craziness extends and suddenly, you’ve written a scene where they decided to go to Arizona out of the blue. Those are the moments I live for. I remember stopping and rereading the page and thinking: Arizona? For real? Why? It’s the middle of summer! And of course even those thoughts become part of the story. But I’d say once they took off for Arizona, the story really started to take shape. And can you imagine how I laughed when Ginny showed up and asked what she asked? I mean, wow. I had no idea where she was about to take him during that scene, and then when I wrote that part, I thought: Amy, you’re nuts. But I just kept writing because it was working. It was odd, but it was working. Booking Mama: I have to tell you that I adored the ants in this novel, and I do agree that everybody does see ants! I could picture the little guys perfectly through your fantastic descriptions and I did find myself giggling a few times. Since the ants were a little bit strange and not exactly "typical" characters (kind of like the pagoda in PLEASE IGNORE VERA DIETZ), I was curious about how the idea of having Lucky see the ants first came to you? Did you know early on that they were going to be a part of this novel? A.S. King: The ants were in the first draft—but only once. (At the pool, the day Nader beats up Lucky.) They kept talking and I kept writing them down so that by the final draft, they had quite a bit to say. But the idea didn’t really come to me as much as show up in the narrative as I wrote the beating scene. Suddenly he saw the trail of water from the leaky water fountain, and he saw the ants there. Going back to my last answer, I help run my pool and we have a leaky water fountain and ants, so these references came naturally as I wrote. The fact that Lucky felt like he was going crazy right at that moment made the ants don party hats. The rest was history. On that note, I’m really lucky to have an editor who gets my process. This building and then decorating a book takes a while and sometimes it leads to hilarious notes attached to revisions that say things like: I hope you don’t mind, but there’s a brand new character in the book now and it’s a bag of dead leaves that talk about the weather and know about the murder of the neighbor, so see if you think they work. I like them. Or something like that. My editor is a saint, really, when it comes to her patience for my process and her excitement about it. There is nothing like getting a note back that says: OMG These talking ants ROCK. Now, how about we concentrate on exactly what they’re saying. In a few spots, they’re confusing me. Booking Mama: Holy moly, you sure have held some interesting jobs. In your bio, you state that you've recently been an adult literacy teacher and a writer -- pretty admirable... and normal. But you've also been a rare poultry breeder, a photographer, a master printer, a contractor, a summer camp counselor, a pizza delivery driver and a "complete loser who did nothing at all." What was the most interesting job you've ever held? And what was the absolutely worst job you've ever had? A.S. King: All of my jobs have been interesting except for catering. Catering was really the dumbest job I ever got. Started early (I’m a night person, not a morning person) and involved deveining shrimp. What was I thinking? Catering is tied with trying to collect money and get signatures for Clean Water Action in Philadelphia. I lasted one day. It just wasn’t for me. I loved delivering pizza. Loved being a camp counselor. I loved my time in photography—both in college and in darkrooms afterward for a few years. And adult literacy teaching was the most rewarding and awesome job in the world. But writing tops it all. Being able to do something I absolutely love every day is amazing and I thoroughly appreciate how lucky I am. Visiting teens in schools and meeting readers in libraries and bookstores is something I completely enjoy as well, which I didn’t expect. Booking Mama: I love your books and I am always excited for the next one. (I know... you just released this one!) Can you share a little bit about what you are working on next? Do you think you will continue to write for the young adult audience? Or, are you planning on writing for a different audience in the future? A.S. King: I just finished a book called ASK THE PASSENGERS which is about Astrid Jones, a girl who deals with her family’s lack of affection and her small town’s gossip by sending her love to passengers flying in the airplanes overhead. It’s also about Socrates, sisterhood and love. That should come from Little, Brown in 2012. And I’ve been working on the 2013 book this summer. I’m not going to tell you what’s that about, though. It’s a serious tinfoil hat project. But I love it so far. And like last time we talked, I have no idea what it’s really about yet, but I hope to work it out over the winter. Amy, it's always a pleasure to "talk" with you! I wish you the best of luck and success with EVERYBODY SEES THE ANTS. Tomorrow, make sure you visit the next stop of the EVERYBODY SEES THE ANTS blog tour -- Mundie Moms. A.S. King is the author of the 2011 Printz Honor Book Please Ignore Vera Dietz and The Dust of 100 Dogs. Her short fiction, poetry and nonfiction have been widely published, and several of her stories have won awards including a nomination for the Best New American Voices anthology. She now lives in Pennsylvania with her husband and children. fantastic interview. thank you for this. I love that Amy "pushes the envelope" in her books. I think her characters are different enough to give her readers the message that it's good to be different, even if it's difficult during the teen years. Your interview is fantastic! What a fun interview! I love the bit about Lane 3! I really like that the swimming of laps generated a lot of her ideas for the book. I've wondered about this book and how much deals with the Vietnam War...I think this book is rite up my alley. Amy has become a MUST-READ for me. She's a genius!